This year's TMZ end of year tour is jointly organised with APS and is planned as a farewell tour to the Karpfen or P16 type (Be4/4 1416-1430 and B4 771-786). This type, whose last haunt is now weekday workings on route 5, will be eliminated with the approaching timetable switch (10th December), with most to be shipped to the Ukrainian town of Vinnitsa. The tour will depart Gessnerallee at 10:00 on Sunday 26th November and end at around 14:00. The tour will feature two sets of this type and visit different locations on which the type were typical in their 47 year history. It will end with a depot line-up at Kalbreite with several further units of the type joining in. No registration is necessary and the tour is free of charge but donations will be collected. Besides concluding the history of this particular type, the demise of the Karpfen marks the end of over sixty years of Be4/4 + B4 operation in Zürich. Search news archive for P16. 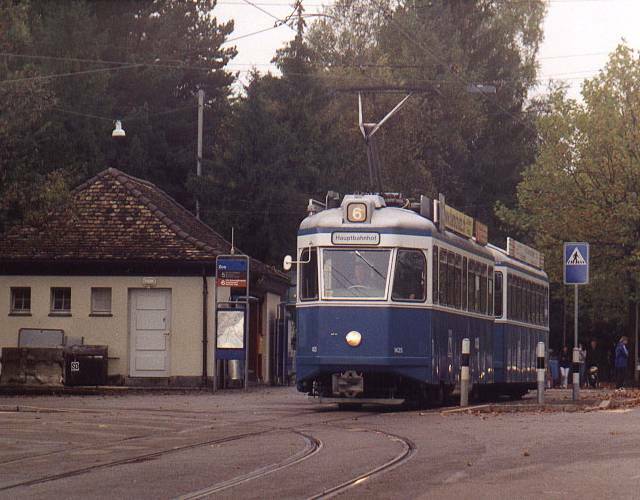 Read chapters of this website's 2005 article on the pre-history of the Swiss Standard Tram and the Karpfen or P16 type.